Much effort is undertaken in protecting government networks themselves. IT administrators must accommodate potential access to various levels of secure networks, depending on the message and the need. 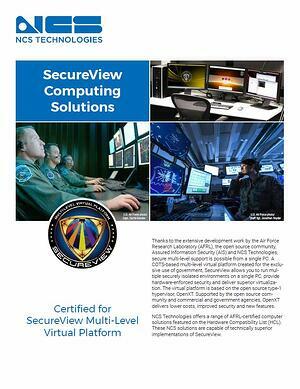 This is known as multi-level computing.When knowledge workers routinely access multiple networks, depending on the level of security needed, they often use SecureView, developed by the Air Force Research Laboratory (AFRL) and implemented by NCS Technologies. SecureView runs multiple securely isolated environments on one PC or workstation, with hardware-enforced security. This security solution is the result of continuing development work by AFRL, the open source community, Assured Information Security and NCS Technologies.